Amsterdam, the Netherlands and San Francisco, USA – In a move to accelerate the transformation of the healthcare industry, Royal Philips (NYSE: PHG AEX: PHIA) and salesforce.com (NYSE:CRM) today announced a strategic alliance to deliver an open, cloud-based healthcare platform, leveraging Philips’ leading positions in medical technology, clinical applications and clinical informatics and salesforce.com’s leadership in enterprise cloud computing, innovation and customer engagement. Patient relationship management will be at the center of the envisioned platform, allowing caregivers to collaborate closely in support of their patients. The platform will enable medical device and data interoperability -- the collection of data and subsequent analysis to enhance clinical decision making by professionals and enabling patients to take a more active role in managing their personal health. "We have entered a new transformative era for healthcare, and technology is enabling the industry to connect to, care for and engage with patients and each other in a profound new way,” said Marc Benioff, chairman and CEO, salesforce.com. “Together with Philips, we are creating an open health platform and ecosystem to benefit everyone that cares about one of the most important issues of our time." 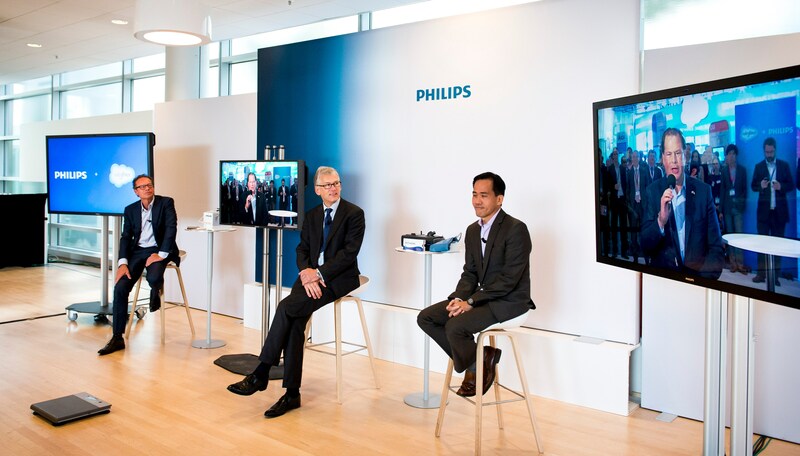 Philips and salesforce.com envision that apps will cover the continuum of care: from self-care and prevention, to diagnosis and treatment through recovery and wellness. The envisioned platform, based on the Salesforce1 Platform, will enable collaboration and workflow, as well as integration of data from multiple sources worldwide, including electronic medical records, diagnostic and treatment information obtained through Philips’ imaging equipment, monitoring equipment, personal devices and technologies like Apple’s HealthKit. Moreover, the cloud-based platform is designed to be highly scalable with built-in privacy and data security. By combining the data, the platform will allow for analysis that will enhance decision making by professionals and engage patients. Both Philips and Salesforce.com foresee that the platform, will utilize Philips’ clinical data stores and medical device interoperability. It is intended to be open to developers and is expected to result in a vibrant ecosystem of partners creating applications. As a result, the envisioned platform has the potential to transform both professional healthcare delivery and continuous personal health management. Salesforce.com is the world’s largest provider of customer relationship management (CRM) software. For more information about salesforce.com (NYSE:CRM), visit: www.salesforce.com. This press release contains forward-looking statements, including statements relating to future products and features. The achievement or success of the matters covered by such forward-looking statements involves risks, uncertainties and assumptions. If any such risks or uncertainties materialize, or if any of the assumptions prove incorrect, the company’s results could differ materially from the results expressed or implied by the forward-looking statements we make. Further information on factors that could affect the company’s financial and other results is included in the reports on Forms 10-K, 10-Q and 8-K and in other filings we make with the Securities and Exchange Commission from time to time, including the company’s most recent Form 10-K. These documents are available on the SEC Filings section of the Investor Information section of the company’s website atwww.salesforce.com/investor. Salesforce.com, inc. assumes no obligation and does not intend to update these forward-looking statements, except as required by law.